After weeks of negative headlines on tariffs we are do some positive news on earnings. 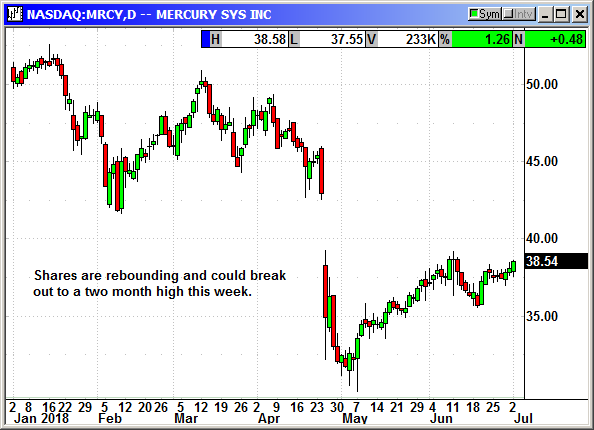 The markets appear to be poised to rebound from the current three-week decline. The Dow was knocked back to correction territory but the S&P and Nasdaq, although weak, never declined more than about 5% or less. 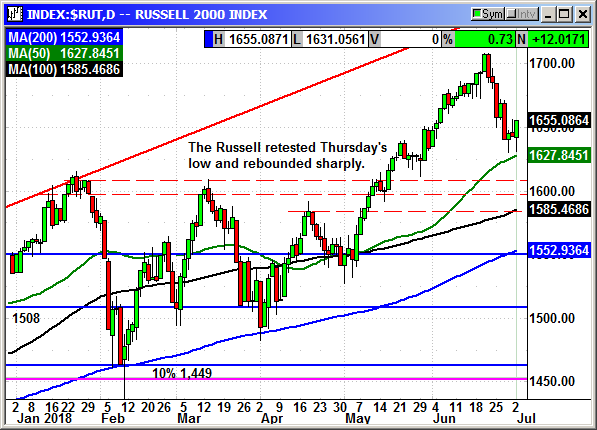 The Russell 2000 retreated about 3.8% from the closing high to the closing low. Everybody knows there will be additional tariff headlines to rock the market but it appears we have reached a point where the news is having less of an impact on the market. Whether that trend will continue depends on the severity of the future headlines. In an interview on Monday, Michael Dell said the "U.S. and China were locked into a path of mutually assured destruction" on tariffs. Hopefully somebody blinks before we actually go down that path. I have been expecting the first two days this week to be volatile, but after July 4th I expect to see a temporary rebound into the earnings cycle. By the end of July, I expect to see another decline as headlines heat up and we near the bearish August/September period. The economic reports on Tuesday are nothing special and they should not move the market. President Trump could tweet about his breakfast and it would cause more movement. 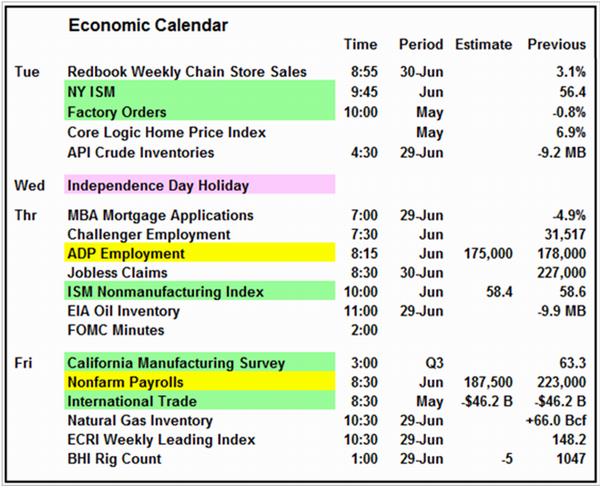 Thursday and Friday are payroll days and while important, they are not likely to move the market unless there is a significant difference from the estimates. Tariff headlines will rule the market for the next several weeks. There are no earnings of consequence. This is the slowest week of the cycle and they will begin accelerating again the next week. The current forecast is 19.8% growth for Q2. The S&P has been holding over support at 2,700 despite some significant declines. T always seems to recover at the last minute. However, resistance at 2,750 has been equally strong. The S&P is governed by about 20 stocks. Half of them could be considered industrials and the other half tech stocks. I read on Monday that 80% of the S&P gains this year were due to the top five stocks and four of them were tech stocks. We need the broader market to catch fire and not be so dependent on the ultra big caps. The Dow battled back from a -194 point loss to close with a minor gain. 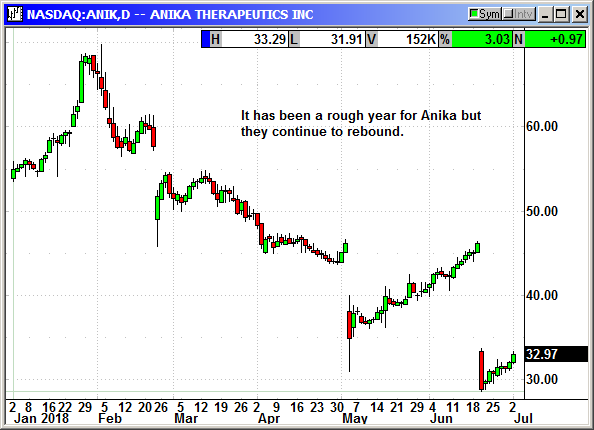 However, this rebound could have set the stage for a post holiday rebound. The index has rebounded from 24,100 four times in the last six days. There was one penetration to touch 24,000 and that was instantly bought. We need to see it move above the 100-day and 50-day averages at 24,600-24,616. 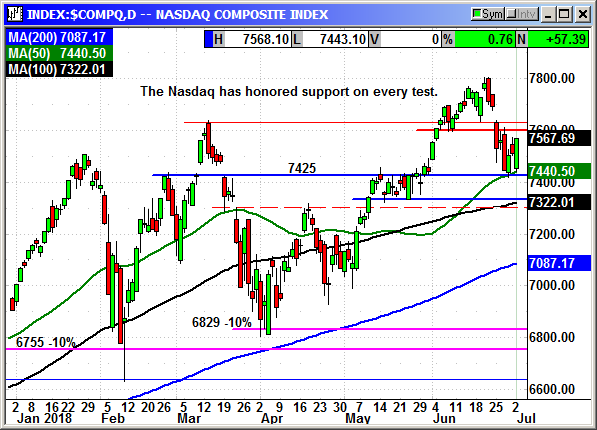 The Nasdaq Composite rebounded from the touch of the 50-day at 7,440 on Monday and the touch of support at 7,425 on Thursday. Despite multiple attempts, support has held and we had an excellent rebound today to gain 57 points. 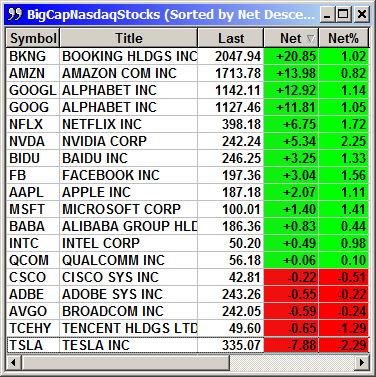 The big cap tech stocks were mostly positive with the giant stocks all in the top 5 on the list. This is positive to see investors come back into the techs in a big way. The Russell 2000 remains the strongest index with only a -3.8% decline from the high. Today was the second test of the 1,630 level and both times the dips were bought. Headlines rule. It does not make any difference how the charts look. Depending on their severity the tariff headlines can push the market around like a butterfly in a hurricane. We just need to keep some dry powder and be ready to jump on the rally train if we see it leaving the station. 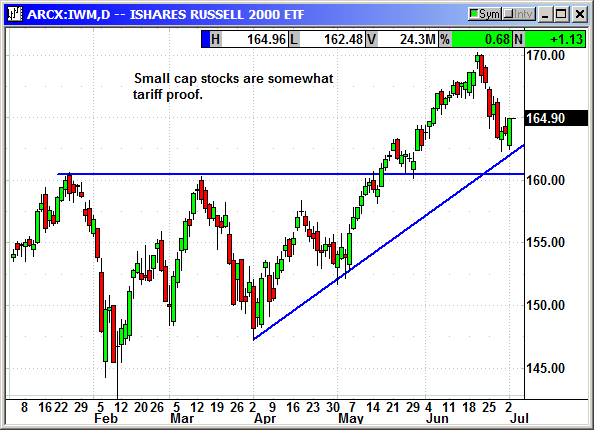 If you have not entered the IWM position, Tuesday would be the day to do it. If we are going to have a rebound it should begin after July 4th. 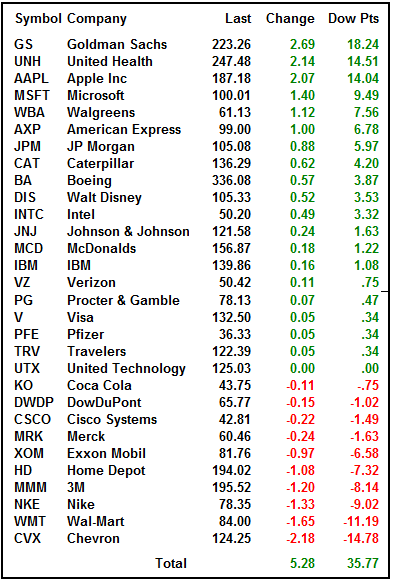 There are no guarantees but earnings are coming fast and investors have a bearish posture. I expect to see a lot of converts late this week if there are no headlines. Buy Aug $35 Call, currently $1.65, initial stop loss $28.35. The long call position was stopped at $76.85. 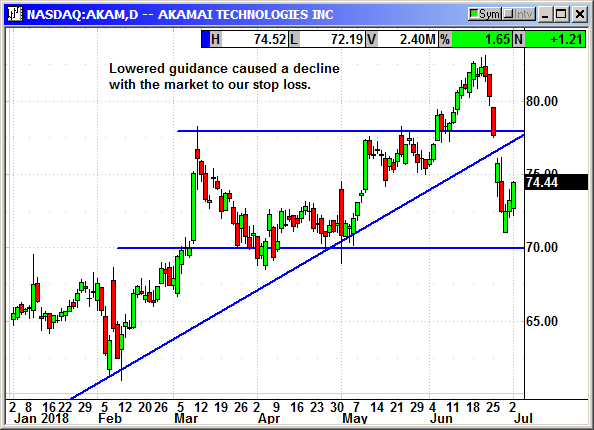 Akamai lowered the top end of their revenue guidance before the open on Tuesday. Shares gapped lower to stop us out. Closed 6/26: Long August $75 call @ $4.30, exit $4.20, -.10 loss. No specific news. 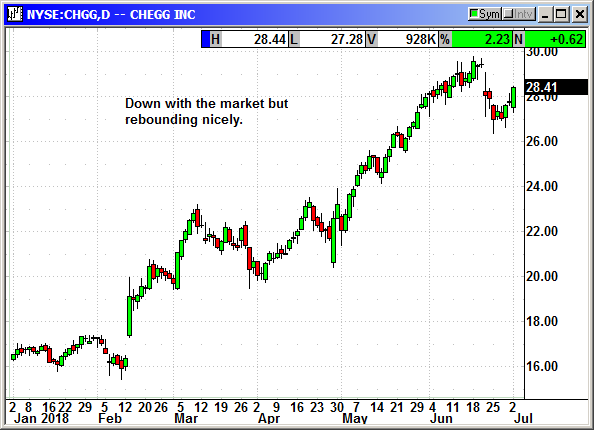 Shares fell with the market but are rebounding nicely. No specific news. Small caps are still the strongest index but they did fall again with the Nasdaq last week. Original Trade Description: June 25th. The S&P futures have recovered from -4.50 earlier in the session to +3. 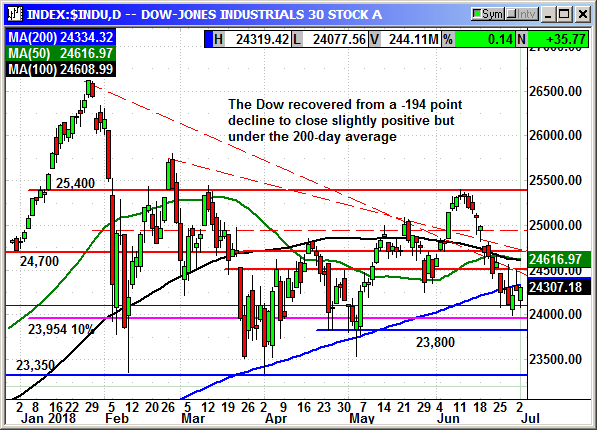 The Dow dipped to the 200-day and then rebounded to close just below that critical average. It could be close enough to attract some risk takers. 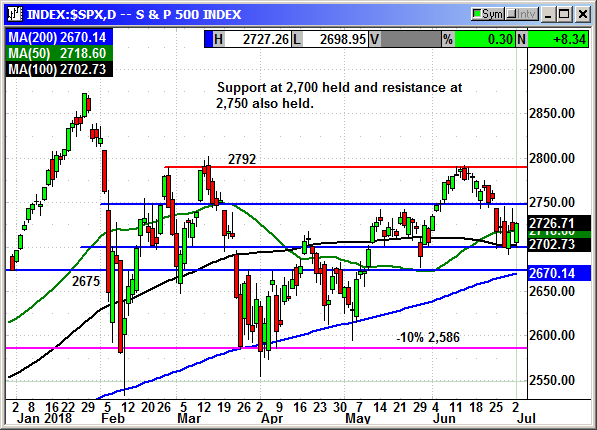 The S&P dipped to the strong support of the 100-day at 2,702 and rebounded to close just above the 50-day at 2,716. These averages should be decent support as long as there are no additional tariff surprises. In President Trump's speech tonight, he was careful to push hard on the topic that the tariff war would be resolved peacefully. While we may not end up with no tariffs between countries, he teased that tariffs would be reduced significantly. That appeared to ease the market tensions overnight. I wanted to play the SPY instead of the IWM because it has fallen farther and could rebound the most. However, as long as there are tariff threats the place to be is the Russell and the drop in the IWM gave us an entry point. Long Sept $168 call @ $3.66, see portfolio graphic for stop loss. Optional: Short Sept $155 put @ $2.38, see portfolio graphic for stop loss. No specific news. Shares are rebounding again. Long October $40 call @ $2.60, see portfolio graphic for stop loss. 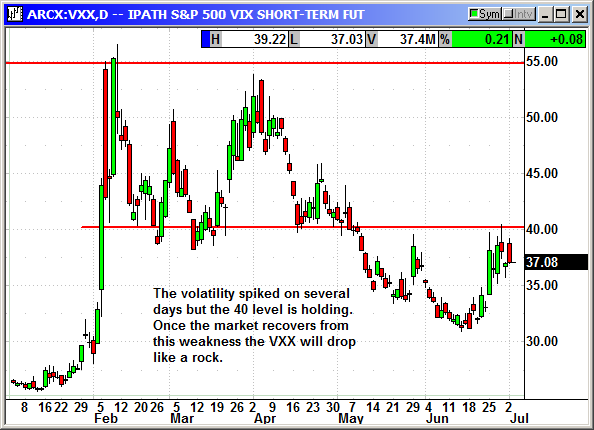 The VXX spiked on the renewed volatility in the Dow but the $40 resistance is holding. This tariff tantrum will eventually become resolved or fall into the category of old news.